Considering that half of the physics degree-granting departments in the US have fewer than 8 students graduate per year,1 many participants at the 2016 Quadrennial Physics Congress were astounded to spend three days surrounded by nearly 1,200 of their fellow physics degree seekers. 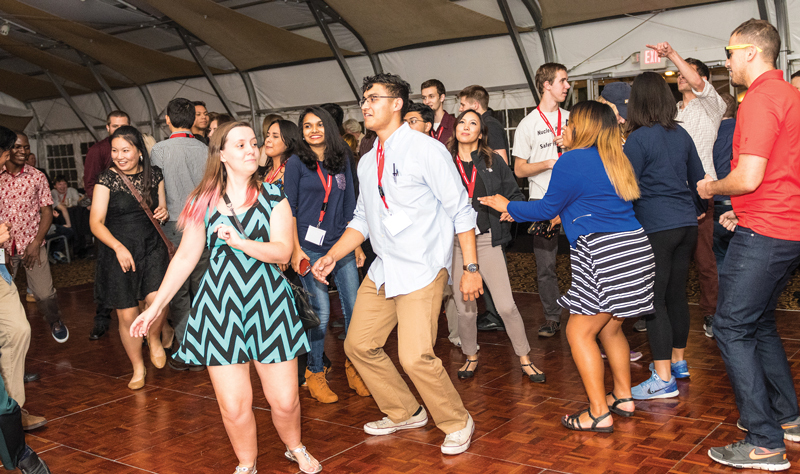 Unofficially billed as the largest gathering of undergraduate physics students in the world, “PhysCon,” held November 3-5, 2016, in San Francisco, CA, opened students’ eyes to new worlds of study, exciting ways to engage others in physics, and fostered what are sure to be lifelong connections and friendships. In the following pages we’ll provide an overview of the congress and hear from the students about how their lives were transformed through this unique opportunity. Attendees gravitated to PhysCon from across the country and around the world. Coming from over 180 institutions in 45 states, the District of Columbia, Puerto Rico, Canada, Hungary, and Mexico, and with women making up over 1/3 of the participants, many students were struck by how the congress could be so diverse yet foster the common bonds of a passion for physics and astronomy. Hampton University sophomore Angelina Gallego observed, “It made me feel so welcomed to see such a diverse crowd of men, women, and different ethnicities. It also made me see that there are others just like me out there trying to be physicist[s], too, and it made me feel not so alone." The diversity of PhysCon 2016 wasn’t limited to just the faces in the room. Plenaries, workshops, tours, poster sessions, and networking events all provided opportunities to better understand the many facets of physics. Many students kicked off their congress experience with a tour of one of four Silicon Valley hot spots. The early birds in the crowd left the host Hyatt Regency Hotel at 6:30 a.m. to journey to the SLAC National Accelerator Lab. Students from Cleveland State University describe their visit to SLAC in deeper detail on p. 14. Other students took advantage of the opportunity to go behind the scenes at X (formerly known as Google X) to learn more about how Project Loon will change how the world views Internet access and just how close we are to having self-driving cars as an everyday occurrence. Two other groups took in a planetarium show at the renowned California Academy of Sciences and traced the roots of smartphones back to the abacus at the Computer History Museum. 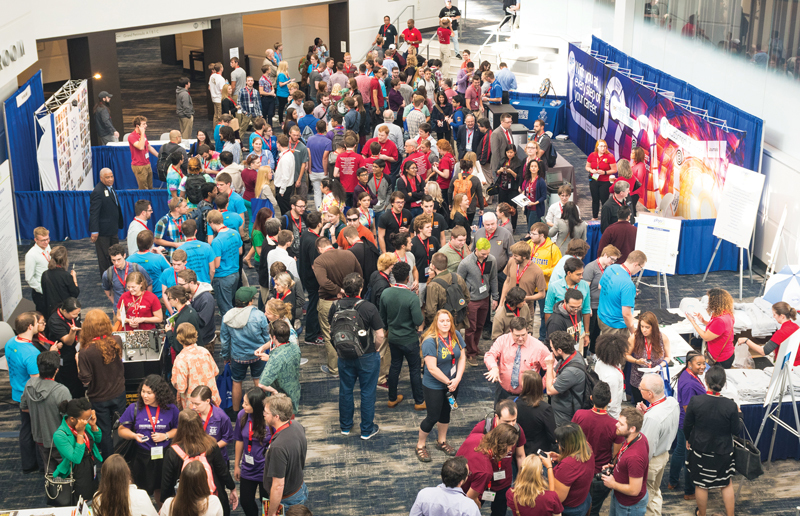 When they weren’t exploring our host city, students were encouraged to visit the Exhibit Hall to engage with graduate schools, nonprofit science education and outreach organizations, AIP Member Societies, and other physics-related groups. From finding out the best ways to study for the physics GRE to trying out a bed of nails from California State University – Fresno, students were able to find topics of interest and begin making connections to further their careers. The connections continued via a networking reception where attendees crossed lines of geography and subdiscipline to learn about their companions for the next few days. See p. 16 for reflections on this event from Pacific Union College. With the energy of these tours, the Exhibit Hall, and the networking reception, students were engaged and enthusiastic about taking part in the opening session. Dr. Willie Rockward, Sigma Pi Sigma president and associate professor at Morehouse College, officially called the congress to order and welcomed the body to San Francisco. In addition to Burnell, other plenary speakers included Neil Turok of South Africa’s Perimeter Institute; Persis Drell, dean of Stanford’s School of Engineering; S. James Gates of the University of Maryland; and Nobel laureate Eric Cornell. Patrick Brady, an Executive Committee member of the LIGO Scientific Collaboration, closed the congress with a riveting talk on the detection of gravitational waves. Each speaker took care to stress how working on diverse teams has positively impacted their professional trajectories and encouraged the students in the room to find ways to broaden participation in science. Friday morning, students awoke to join over 80 scientists from a broad array of fields at Breakfast with the Scientists. Students and professionals were able to take advantage of the intimate format to discuss topics ranging from theories of supersymmetry to career paths for physics majors to advice on how to find a good graduate school. The art gallery featured the students’ abilities to convey the beauty of science in sculpture, painting, drawing, mixed media, and other formats. Many of the gallery’s visitors were struck by Caroline Bowen’s three-dimensional depiction of the Big Dipper constellation. She took home both the Best in Show and People’s Choice awards. You can read more about Caroline and her artistic vision as well as the other art winners on p. 22. Thanks to the generosity of the OSA Foundation, top students in both the art gallery and the poster sessions earned awards. Poster winners are listed on pp. 20–21. PhysCon would not have been possible without the generosity of a host of sponsors and donors. On pp. 35–38 you will find the names of many of the individuals and organizations who contributed resources to make PhysCon happen and directly support travel costs for more than 200 attendees. Plans are already in the works for the next PhysCon in 2019, and we hope to involve as many Sigma Pi Sigma alumni as possible. Perhaps you can be one of the scientists at breakfast helping to shape an undergraduate’s career? Or maybe lead a workshop to equip students with valuable professional skills? Or, can you join your peers in contributing financially to make sure PhysCon will persist and more deserving students can attend? Continue to watch this space and consider what role you will play in shaping the future of physics. 1. “Roster of Physics Departments with Enrollment and Degree Data, 2015.” AIP Statistical Research Center, September 2016, read more.